Fall brings some wonderful opportunities to enjoy nature in Northwest Indiana. A herd of bison have recently arrived at their new home in Morocco, Ind. Twenty-five bison made the journey from a Nature Conservancy preserve in South Dakota to the Nature Conservancy at Kankakee Sands. They will help restore 1,100 acres of land by eating grasses, churning the soil and thinning the trees. At one time this land was the largest inland body of water in the entire nation. The Nature Conservancy has been working hard over the past decade to bring this land back to a natural state and is open to the public for hiking, exploring and new bison viewing. The Bison Overlook Area is open and visitors are welcome to see these magnificent animals in person during their visit to Kankakee Sands. 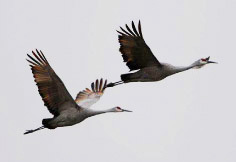 The Sandhill Cranes are making their journey south and make stops at the Jasper-Pulaski Fish and Wildlife Area in Medaryville. If you&apos;re an early riser, you&apos;re sure to catch giant and loud flocks fly out of the marshes to the pasture. They will socialize in Goose Pasture before flying out to feed in local fields. At sunset, the cranes return to Goose Pasture, giving you a perfect opportunity to see thousands of Sandhill Cranes socialize again. Peak viewing times are sunrise and sunset in November, but hundreds of these winged creatures visit Jasper-Pulaski from now until December on their way south. Another can&apos;t-miss stop this fall is Fair Oaks Farms. Whether you are looking for a farm-fresh meal with the family, a quick stop for their award-winning cheeses or an afternoon exploring the Adventure Center, you&apos;ll find it here. Their newest attraction, the Crop Adventure lets you and your family learn about modern farming, burrow deep underground to see bugs and roots and see the high-tech tools farmers use. 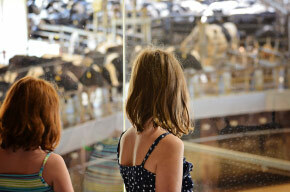 The Dairy and Pig Adventures are also open this fall, a perfect indoor activity for a chilly or rainy day. The Nature Conservancy at Kankakee Sands is located in Morocco. Visit online at www.nature.org/KankakeeSands or call 219-285-2184. Jasper-Pulaski Fish and Wildlife Area is located in Medaryville. Visitors are asked to sign in upon arrival. Learn more at www.in.gov/dnr/fishwild/3091.htm or call 219-843-4841. Fair Oaks Farms is located in Fair Oaks and offers three attractions, special events, a cheese shop and full-service restaurant. Details are available at www.fofarms.com.